What's Up Wednesday hails from the blogs of Jaime Morrow and Erin Funk. Join the fun on your own blog and then go to Jaime's to add your link - it's a great way to share what's going on in your life and get to know other bloggers! First, I'd like to announce the winner(s) of last week's blogoversary Luurve Prize Package: Katy Upperman and Krista McLaughlin! Katy already had a copy of HOW TO LOVE, so she very generously suggested I select a second winner. Thanks for all the anniversary love and for entering the giveaway! Just a note: there are still a couple of days to enter to win a First30 Critique for my freelance editing anniversary! I've read some really great books over the last few weeks. Right now I'm savoring THE CHANCE YOU WON'T RETURN by Annie Cardi, which officially released yesterday. I've waited for this a long time. Annie is so sweet and has a great website and (so far) tells a beautiful story. I'm working very hard to finish a revision/reconstructive surgery on KEYS, but, as so often happens when one revises, I am discovering new depths to the story. As I add elements and further layer the characters, I've come to the conclusion that I may not finish by April 30 (self-imposed deadline) and I'm okay with that. My CPs will just have to wait a bit longer. And just this morning in the shower, I had an inspiration for a short story, which has not happened in many years, and which I will now jot down in my notebook before it completely disappears with the chaos of the morning. We had a nice, laid-back Easter, hosted by my nephew and his wife. Their lovely, serene home has inspired me to de-clutter, so that project starts this weekend - although I'm taking baby steps on that, as I do have a revision to finish! Let's see, what else. Work events, laundry (which still needs to be folded), homework, the usual kid stuff, etc. Very exciting stuff. I feel like this spring has brought a wonderful array of YA Contemporary books into the world, and for that, I am so happy and inspired. I very rarely feel guilty for reading when I could be writing, because losing myself in a good book, especially one in the same genre, is important for my craft. Here's a sample of what's in store for me over the next few weeks - and I've also got OPEN ROAD SUMMER and GUITAR NOTES waiting at the library! Also - spring weather - finally! We got dumped on last week with 10 more inches of snow, but it's ALL GONE NOW. All gone. I always feel inspired when surrounded by great books! Glad to hear spring's finally on the way, too! Your reconstructive surgery revision sounds exciting. I'll admit, I enjoy discovering new depth to my stories while revising. Spring Weather! That is a wonderful thing. In Texas it last about two months (if that), but I love it while it's here. 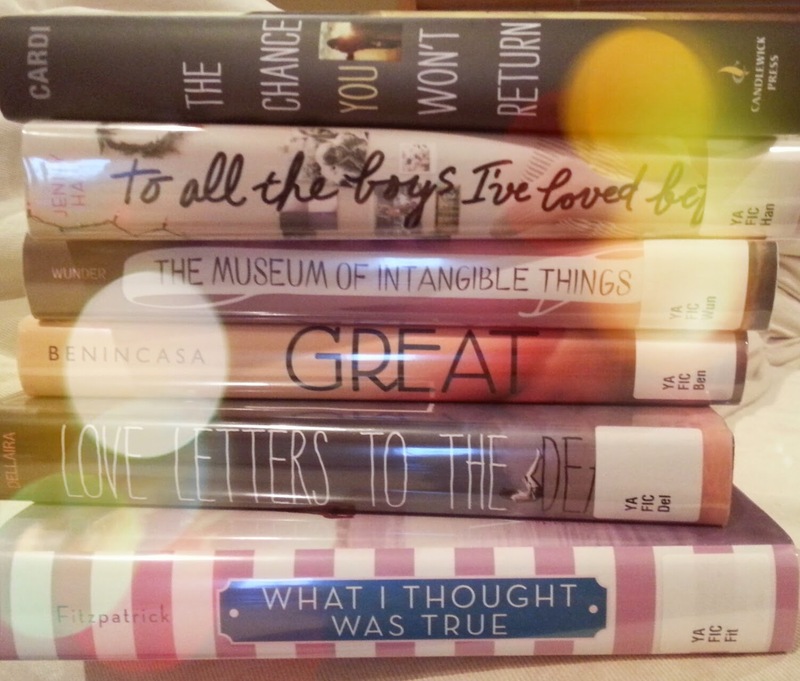 There have been so many great YA contemporary books lately. I'm most through "To All the Boys I've Loved Before" and it's excellent. 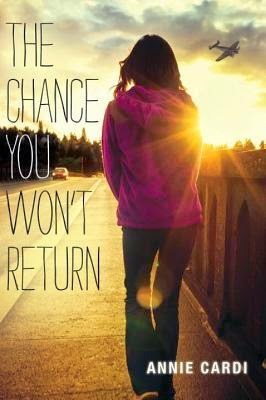 I just heard about The Chance You Won't Return yesterday and I cannot wait to read it. Revisions are tricky that way but that's part of what makes them fun (and maddening... it's a Mad Hatter sort of fun). Good luck! I tend to get a lot of my best ideas in the shower too. Good luck finishing your revisions, and finding time to write this new short story. I find revising to deadlines is sometimes too stressful. You've got to do it for yourself and whatever works best for the story. I haven't read a contemporary in a while, but you're definitely making me want to gobble a bunch up. I've been reading a lot of sci-fi and fantasy, which I love, but I think I need a little break. I'll have to check out the books you have in that stack. :-) I'm with you on not feeling guilty about reading instead of writing. It almost always helps my own writing, so that's not wasted time. Dude. Your library rocks. Ours NEVER has new books. By the time they arrive in our silly little town, they're a year old. Oh darn... I guess I'll just have to buy ALL the books. ;-) Thanks again for the awesome giveaway.. I'm so excited to have won. Best of luck with your revision, Sara! I do not know how you all deal with the snow INTO APRIL. Glad it's disappearing. :) And yay for so much great contemporary! Have a great week, Sara!